Matt Mullins, Irena Volkov, and Samantha Hepworth present their I-CORPS projects at the Mathias Student Research Conference. Spring 2018 marked American University’s inaugural participation in the I-CORPS program, which is a National Science Foundation sponsored program developed to foster science and technology entrepreneurship through a five-year $253,000 grant. The program supports commercial development of innovations created here at AU by teaching early stage product and business development based on the Lean Start-Up Model. This approach involved the development of a business model based on the concept of “customer discovery” to test whether a technology venture idea has merit. The inaugural spring 2018 cohort currently consists of six individual teams of undergraduate and graduate students receiving $2,250 in funding for customer discovery and prototype development during the semester-long program. The AFRL team consists of Samantha Hepworth from American University and Griffin Romigh from the Air Force Research Lab, Battlespace Acoustics Division. They have developed two products derived from taking state-of-the-art military technology and transforming them into intuitive, easily implemented products. They developed a User Calibration Technology, which is an efficient way to calculate an individual’s Head Related Transfer Function (HRTF)—a measurement that characterizes how one’s ear receives a sound. This product has virtual reality and military applications. They have also developed a Training and Safety Testing Technology, which is a simple, lightweight system used to evaluate user hearing responses in different environments and headgear. It can also be used to train user responses to emergency signals and has construction and military applications. Hepworth has submitted a Small Business Technology Transfer application for additional funding with the help of AU’s audio technology department. The IEC Solutions team consists of Noy Kaufman, a senior at American University, and AU Chemistry Professor Douglas Fox. They have developed Ion Exchange columns using Cellulose Nano Particles (CNCs) that perform cation exchange and anion exchange. This is a unique method for exchanging solutions and provides a more customizable approach to solution making. The industrial applications of this technology include epoxy, latex, medical, and polymer applications. The Bright Bite Block team consists of Irena Volkov, a junior at American University, Nathan Master, a freshman at American University, and Assistant Biology Professor John Bracht. Their technology is a medical tube securing tool and bite block that uses molars for strength and maneuverability, has an adjustable track to minimize pressure, and prevents skin, lip, and teeth damage. This technology has commercial applications in surgical intensive care units, burn units, military applications, and EMT applications. Specifically, this technology will help burn victims, the elderly, anxiety patients, and patients undergoing surgical procedures. Volkov and Noy Kaufman, from the IEC solutions team, are both traveling to Boston to attend a medical device conference to network for their technologies. The Feliscan team consists of Emmanuel Mayegun-Adeola and Payal Dudhedia, AU graduate students, and Kathryn Walters-Conte, director of AU’s Biotechnology Program. They are developing a genetic testing service for feline breed identification and for the prediction of diseases and traits in cats. Currently, about 35 cat genes contain more than 55 mutations related to cat appearance and health. The applications and benefits of this technology include ancestry and species identification for domestic pets, the prevention of undesired diseases or traits from proliferating in populations, and also the ability to weigh risk factors for making smart breeding decisions. The Sand Scan team consists of Matthew Mullin, an AU undergraduate student. He has developed a drone that carries a high-resolution camera. Geotagged images can then be uploaded to his servers where the flight data is processed to stitch aerial images together into 3-D models. The commercial applications of this technology include insurance, real estate, emergency response, and construction. Mullin has even had the opportunity to put his technology into action by surveying flood damage in Sandwich, Massachusetts. Lastly, the Text Mining team consists of Chelsey Cao, an AU senior, Sarah Givens, an AU sophomore, Lindsay Reesing, an AU graduate student, and Professor Derrick Cogburn from the School of International Service and Kogod School of Business. They are developing a computational text mining technology that can be used to analyze large-scale, unstructured textual data with minimal human reading. Seventy-five to eighty-five percent of available data is unstructured text, making it perhaps the largest single data source for the modern social science investigator. The commercial use of text mining technology is consulting services with potential clients from the private sector, public sector, and NGOs. The inaugural 2018 I-CORPS cohort has seen a lot of success. 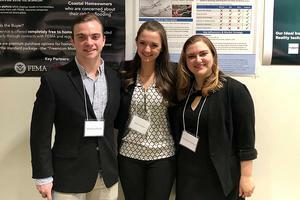 Mullin, Hepworth, Volkov, and Kaufman had the opportunity to present their I-CORPS work at the Annual Robyn Rafferty Mathias Student Research Conference. In fact, Volkov won the award for best undergraduate poster presentation in the life sciences.